I’ve always been particularly pleased with that quote, for one reason above all others. Back in September 2014, I was up in Scotland visiting my Mum and brother Alan in Larkhall. One day, we were doing a little bit of grocery shopping in the main street, so we popped into Burns the stationer. Larkhall is a small town, and doesn’t have a dedicated bookshop, but the stationer has a nice little selection of books. They’ve got a particularly good range of local history, as well as some general Scottish interest books and some best sellers. My partner Sandra was having a good browse (point her at a shelf of books and she’s in her element) and I was flicking through a Broons or Oor Wullie book and chuckling to myself when she came up to me and thrust this book into my hands. 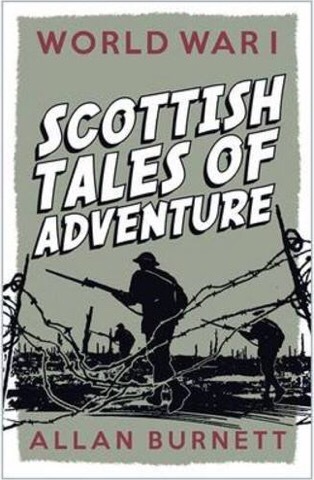 It was World War I Scottish Tales of Adventure, by Allan Burnett. At this point, I’d submitted my book to the Great War Dundee Children’s Book Prize, but I hadn’t heard anything about the shortlist, so the First World War was on my mind quite a lot. I was sold. I walked straight to the till and bought the book. It looked exactly what I wanted to read. My only complaint was that I’d found it after writing my own book! Its combination of dramatic true-life narrative and historical detail would have helped me enormously. It was only later, after I’d made the shortlist for the competition, that I discovered that Allan Burnett was one of the judges. Sandra insisted that it had to be a good omen! So when my book actually won, and Allan Burnett’s quote appeared on the cover, it just seemed absolutely fitting. It’s great that my book is his kind of story – because his book is my kind of story.